Opera is a sung stage drama set to music which usually plays continuously throughout the performance. What is the difference between opera and musicals? Musicals are plays with music; the music is incidental and the action is advanced mainly through dialogue. Why is opera so special? Opera is a unique fusion of words, music and design. These ingredients, when combined, deliver large amounts of information to the audience simultaneously – information about the characters’ outlook, feelings, motivations and actions. If the composer, librettist, designer and director all rise to the challenges of the art-form, the result, for the audience, can be uniquely absorbing, moving, and thrilling. John Smith, a physicist at the University of New South Wales in Sydney, Australia, belts out an answer to this query. The mezzo-soprano has a lower range than the soprano. Many mezzo-sopranos sing the so-called "trouser" roles, portraying young boys or men. They can also be the villainesses or motherly types. This category is also sub-divided into coloratura mezzo, dramatic mezzo, and lyric mezzo. One of the most well known roles for a dramatic mezzo is the fiery gypsy Carmen in the opera of the same name. For males, the tenor is generally considered to be the highest male voice in an opera, and is most often the hero or the love interest of the story. There are many different types of tenor voices. Two of the more common ones are lyric tenors, whose voices have high, bright tones, and dramatic tenors whose voices have a darker sound with a ringing quality in the upper range. Some of the more famous roles for tenors include Rodolfo inLa bohème (lyric) and Radames in Aida (dramatic). Dido, the widowed Queen of Carthage, entertains the Trojan Prince Aeneas, shipwrecked on his way to Italy, where he will found a new Troy. Dido and Aeneas are in love. Witches plot Dido’s destruction and the Sorceress conjures a storm, to break out when the royal couple are hunting, and the impersonation of Mercury by one of her coven. The storm duly breaks and the courtiers hasten back to town, while the false Mercury tells Aeneas he must leave Dido and sail for Italy. This opening scene comprises two parts. The first establishes the conflicting interests of the Gods, before seamlessly shifting to the seashore in Carthage where Aeneas and his Trojan fleet have been safely washed up after the storm has abated. Dido, queen of Carthage, cannot bring herself to admit her love for the Trojan prince Aeneas, a guest at her court; he is soon to resume his journey in search of a site for a new city to replace Troy. Her confidante Belinda and her courtiers persuade Dido to speak her love and the act ends with general rejoicing. A sorceress and her witches plot the downfall of Dido and Carthage. Their plan is to "conjure up a storm" and force the lovers to take refuge in a cave, where an elf, disguised as Mercury, will remind Aeneas of his duties. Meanwhile, Dido and Aeneas, having spent the night together, are being entertained in a grove by Belinda and a courtier. A storm arises and the lovers are separated; Aeneas enters the witches' cave and is commanded by the false Mercury to leave Carthage. At the quayside Aeneas's men are preparing to leave. The witches gloat over their victory and sing of their delight. Back at court, Dido has been informed of her lover's planned departure and seeks Belinda's counsel. The queen confronts Aeneas, silences his excuses and dismisses him. After her lament ("When I am laid in earth"), Dido kills herself. Cupids mourn her, scattering roses on her tomb. The witch is plotting the destruction of Carthage and its queen, and calls in her companions to help her in her evil plans. She plans to send her "trusted elf" disguised as Mercury, someone to whom Aeneas will surely listen, to tempt him to leave Dido and head back to Troy. This would leave Dido heart-broken, and she would surely die. Dido and Aeneas are accompanied by their train. They stop at the grove to take in its beauty. This is all stopped when Dido hears a distant thunder, prompting Belinda to tell the servants to prepare for a return to shelter as soon as possible. As every other character leaves the stage, Aeneas is stopped by the Sorceress's elf who is disguised as Mercury. This pretend Mercury brings the command of Jove that Aeneas is to wait no longer in beginning his task of creating a new Troy on Latin soil. Aeneas consents to the wishes of what he believes are the gods, but is heart-broken that he will have to leave Dido. He then goes off-stage to prepare for his departure from Carthage. Preparations are being made for the departure of the Trojan fleet. The sailors sing a song, which is followed shortly by the Sorceress and her companions' sudden appearance. The group is happy with how well their plan has worked, and the Sorceress sings a solo describing her further plans for the destruction of Aeneas "on the ocean". Dido and Belinda enter, shocked at Aeneas’ disappearance. Dido is distraught and Belinda comforts her. 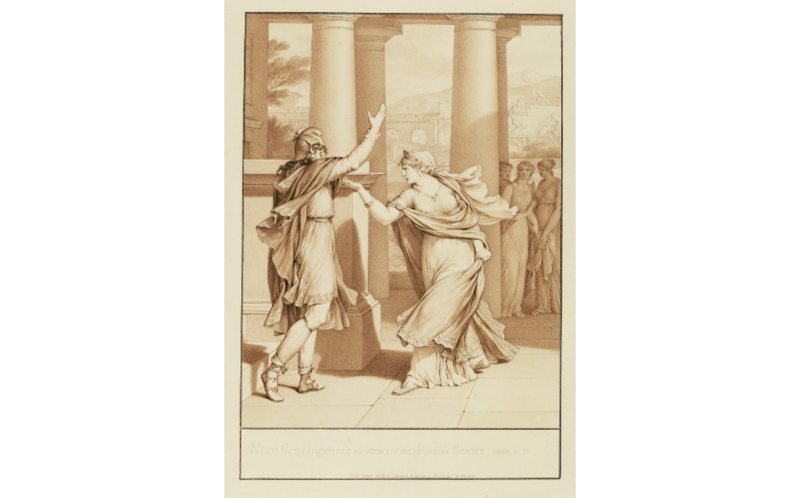 Suddenly Aeneas returns, but Dido is full of fear before Aeneas speaks, and his words only serve to confirm her suspicions. She derides his reasons for leaving, and even when Aeneas says he will defy the gods and not leave Carthage, Dido rejects him for having once thought of leaving her. After Dido forces Aeneas to leave, she states that "Death must come when he is gone."